You are here: Home � All Deals , Media: Books Movies Magazines MP3s � Alfred Hitchcock's movie collection from for $53.99. It has 14 films in total working out to $3.85 cents a movie. Alfred Hitchcock's movie collection from for $53.99. It has 14 films in total working out to $3.85 cents a movie. 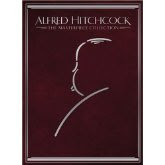 Amazon.com is selling a collection of 14 Alfred Hitchcock films for $53.99. This offer is until 12 midnight tonight [Oct 28th, 09]. The deal works out to be $3.85 per film. If you get this package you'll receive the following titles "Psycho," "Vertigo," "Rear Window," "The Birds," "Shadow of a Doubt," "Family Plot," "Frenzy," "The Man Who Knew Too Much," "Marnie," "Rope," "Saboteur," "Topaz," "Torn Curtain," and "The Trouble with Harry." The suggested MSRP price is $119.98. So you will be saving over 55%. This would make for a unique Christmas gift for an Hitchcock fan. Each movie also includes documentaries, commentaries, and other bonus matieral. To take advantage of this offer click here to goto Amazon.com's offer page.